Beef as we know it today is problematic and people's knee jerk reaction is to avoid beef all together. Stop I know you want to just react but think about things, breathe and slow it down. It can't be that beef is inherently bad, how would we have evolved and survived this long otherwise? How are the Masai and Inuit still living? The problem isn't beef, it's about how they've been raised. Kind of like the big dog argument right, are big dogs inherently bad or is it more about how they've been raised? Let's apply the same logic. Let's not throw the baby (or in this case the beef) out with the bath water. Cows much like humans were never meant to be cooped up all day. Even more like humans, their diet was never meant to be majority corn, soy and other grains (sugars). They've grown fat and sick just like us. Woody Allen's 1973 film "Sleeper"
A diet of unhealthy GMO grains is called "vegetarian fed." This also applies for humans. If beef is "toxic," then human meat would be even more toxic for the same reasons. Due to their poor health, weak immune system, lack of robustness, and unsanitary living conditions, they're given antibiotics (humans up take up to 10x more antibiotics than cows), drugs, and hormones. This still pales in comparison to the treatments humans get. Even feed-lot cows start off on mother's milk, grass, and live out on the pasture for the first 6-12 months. This is to keep them alive, this is how important this way of living is for cows. Then they're sent to the lots. Grass-fed cows remain on the grasslands. Since the term grass-fed isn't clearly defined yet, get to know your farmer or butcher or anyone who you get food from. We've always maintained relationships with the people who provide us food... until now. Food keeps us alive, it's that important, it only makes sense to maintain that relationship. It's for your own best interest. Grass-fed cows have less total fat and the type of fats they have are more healthy than feed-lot cows. They have more CLA which is known for many beneficial properties, such as reducing body fat. They also have more Omega-3, associated with lowering inflammation, cancer fighting properties, heart health, and brain health. They have more Vitamin A, E, B12, B3, B6, Iron, Selenium, Zinc, Potassium, Phosphorus, Sodium along with many other nutrients humans need. It has a high amount of bio-available protein and other nutrients like Creatine and Carnosine; same is true for eggs. A combination of supplements, vegetables, and fruits would be less effective as far as bio-available nutritional content. It makes you wonder why we don't use the term superfood more often for meats. Many of these properties also exist in regular beef as well. 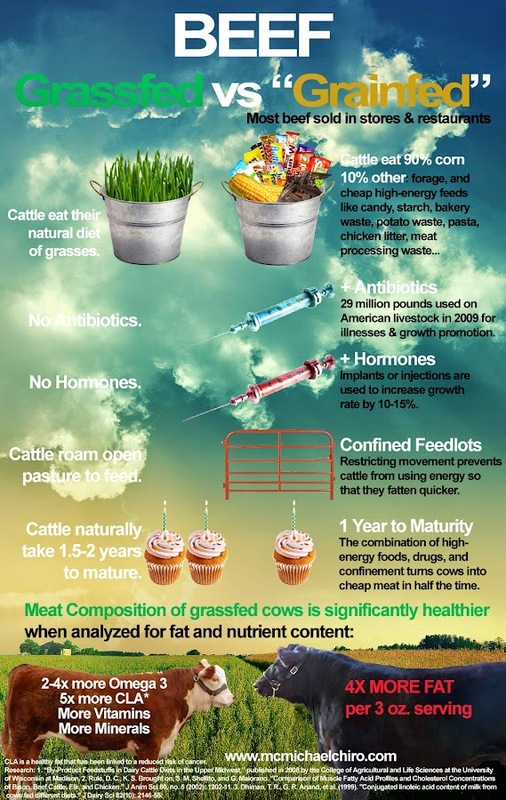 If you can't afford to eat only grass-fed, occasionally supplement with grass-fed beef. Use the right type of oil and don't over cook your meat. There's nothing that robs the flavor of beef than overcooking it. If being humane is important, instead of us getting rid of beef (which also means getting rid of cows), let's demand for more humane natural eating and living situations for them. Check out Eat Wild to find local vendors.